The wait is over! 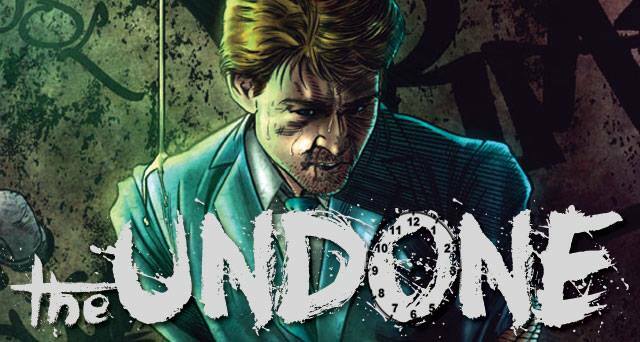 Mikebooks is proud to announce a new comic book series called The Undone! Dylan Sharpe has the ability to rewind time in 24 hour intervals whenever he wants a “do-over” in life. But when he tries to cash in on his powers it puts him at odds with…The Undone. The Undone #1 is being released as a brand new Kickstarter project. Kickstarter is a crowdfunding platform. The company’s stated mission is to help bring creative projects to life. If Mikebooks reaches the stated goal of $2500 before April 18th, 2014 the book will be funded and produced. What if you could rewind time? Get a do-over whenever you wanted? Would you use your power to strike it rich on the lottery? Bet it all on the underdog to win the Super Bowl and cash in? Of course you would…but you’d be wrong. You’d find out the future is in constant flux and nothing happens the same twice. Your numbers are always off the second time around and instead of cashing in on that miracle catch that never happened, you’re indebted to a lot of unsavory folks looking to collect. So what’s left to do? Easy…you move to New York City and take your powers to the stock market. Because the global actions of movers and shakers don’t seem to vary much from day to day. And from there, you build a life, a good life, rewinding when you have to and slowly, over the course of a couple of months, building yourself up into a mover and shaker yourself. That is…until they come calling. The Undone…a secret network of traders who have been working this angle for years, with the same abilities you thought only you possessed (narcissist). And now, they’re pissed. Because nobody likes it when someone muscles in on their territory. Especially not a narcissistic, snot-nosed kid like you. Your name is Dylan Sharpe. The Undone #1 Kickstarter has officially launched!